Evidence is building that net cloud feedback is likely positive and unlikely to be strongly negative. The effect of clouds in a warming world is complicated. One challenge is that clouds cause both warming and cooling. Low-level clouds tend to cool by reflecting sunlight. 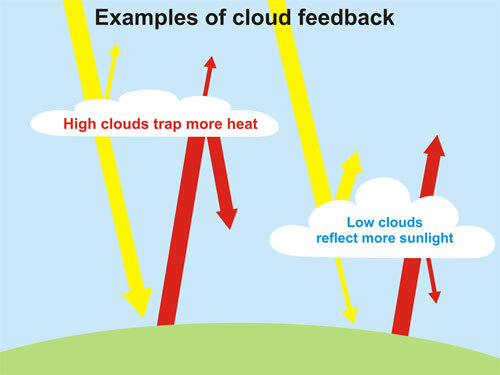 High-level clouds tend to warm by trapping heat. As the planet warms, clouds have a cooling effect if there are more low-level clouds or less high-level clouds. Clouds would cause more warming if the opposite is true. To work out the overall effect, scientists need to know which types of clouds are increasing or decreasing. Some climate scientists, such as Richard Lindzen and Roy Spencer, are skeptical that greenhouse gas emissions will cause dangerous warming. Their skepticism is based mainly on uncertainty related to clouds. They believe that when it warms, low-level cloud cover increases. This would mean the Earth's overall reflectiveness would increase. This causes cooling, which would cancel out some of the warming from an increased greenhouse effect. However, recent evidence indicates this is not the case. Two separate studies have looked at cloud changes in the tropics and subtropics using a combination of ship-based cloud observations, satellite observations and climate models. Both found that cloud feedback in this region appears to be positive, meaning more warming. Another study used satellite measurements of cloud cover over the entire planet to measure cloud feedback. Although a very small negative feedback (cooling) could not be ruled out, the overall short-term global cloud feedback was probably positive (warming). It is very unlikely that the cloud feedback will cause enough cooling to offset much of human-caused global warming. While clouds remain an uncertainty, the evidence is building that clouds will probably cause the planet to warm even further, and are very unlikely to cancel out much of human-caused global warming. It's also important to remember that there many other feedbacks besides clouds. There is a large amount of evidence that the net feedback is positive and will amplify global warming. It was suggested I move this discussion to this thread. The numbers show that clouds reflect more energy away then they trap. Given that the albedo has not been decreasing, and if anything has even increased slightly, this is completely inconsistent with clouds operating as a net positive feedback. Clouds cover about 2/3rds of the surface, so 341 W/m^2 x 0.67 = 228 W/m^2 average incident on the clouds. 79 W/m^2 divided by 228 W/m^2 = 0.34 average reflectivity of clouds. 1/3rd of the surface is cloudless, so 341 W/m^2 x 0.33 = 113 W/m^2 average incident on the cloudless surface. 23 W/m^2 divided by 113 W/m^2 = 0.20 average reflectivity of the cloudless surface. 0.34 - 0.20 = 0.14. 341 W/m^2 x 0.14 = 48 W/m^2 loss for each additional m^2 of cloud cover. The cloudy sky has a transmittance of 30 W/m^2, and the surface emitted through the cloudy sky is about 265 W/m^2 (396 x 0.67 = 265). 265 W/m^2 - 30 W/m^2 = 235 W/m^2 absorbed by the cloudy sky. The clear sky has a transmittance of 40 W/m^2, and the surface emitted through the clear sky is 131 W/m^2 (396 x 0.33 = 131). 131 W/m^2 - 40 W/m^2 = 91 W/m^2 absorbed by the clear sky. 91 W/m^2 divided by 131 W/m^2 = 0.69; 235 W/m^2 divided by 265 W/m^2 = 0.89. 0.89 - 0.69 = 0.20 difference between the cloudy and clear sky. 0.20 x 396 W/m^2 = 79 W/m^2 additional absorbed for each additional m^2 of cloud cover. If we assume that roughly half of the absorption and re-emission is back toward the surface (Trenberth actually has this being less than half), that comes to about 39 W/m^2, or about 10 W/m^2 less than the 48 W/m^2 reflected away. *If anyone doubts my calculations, I have backed check them by assuming that if half of the absorption is directed up out to space, then the weighted average totals should correspond to a temperature of about 255K. 0.69/2 (absorbed clear sky) + 0.31 passing through the clear sky = 0.66 and 0.89/2 (absorbed cloudy sky) + 0.11 passing through the cloudy sky = 0.55; 0.66 x 0.33 (clear sky) = 0.22 and 0.55 x 0.67 (cloudy sky) = 0.37; 0.22 + 0.37 = 0.59 emitted to space from the surface; 396 W/m^2 x 0.59 = 234 W/m^2 (about 254K), which is pretty close. These calculations are consistent with general observations - that is cloudy days are usually cooler than sunny days. The opposite would be the case if clouds blocked more energy than they reflect away (cloudy days would be warmer than sunny days). It's true that at night the net effect of clouds tends to warm or slow heat loss, but these calculations are for global averages, so the differences between night and day are already factored in. The only exception to this would be in areas that are permanently snow or ice covered, as I think the reflectivity of clouds is roughly the same as snow and ice, so in these areas the presence of clouds tend to warm by blocking what little surface emitted energy there is. I suggest that you read the post here before commenting further. The numbers show that clouds reflect more energy away then they trap. The main point I'm getting at here is if the albedo is NOT decreasing (or has even slightly increased) and if incrementally more clouds don't trap more energy than they reflect away, where is the energy coming from that is supposed to be causing the enhanced warming? Also - if, as the AGW theory claims, an additional 3.7 W/m^2 at the surface is to become 16.6 W/m^2 largely through positive cloud feedbacks, then why doesn't it take more like 1075 W/m^2 at the surface to offset the 239 W/m^2 coming in from the Sun (16.6/3.7 = 4.5; 239 x 4.5 = 1075)?? The measured response of the system at the surface to incident energy is only about 1.6 (390 W/m^2/239 W/m^2 = 1.6). Since the atmosphere can't create any energy of its own, COE dictates the remaining difference of about 10.6 W/m^2 (3.7 x 1.6 = 6 W/m^2; 16.6 - 6 = 10.6 W/m^2) can only come from a reduced albedo (i.e. the Sun). So again, where is all the energy coming from that is supposed to be causing the enhanced warming? Citation please. Otherwise either case is speculation. Albedo changes due to ice cover change will be measurable and predictable (in extent and effect, if not rate of arrival). Albedo changes due to cloud cover changes to my knowledge are uncertain at best. We'd know more if certain satellites (DSCVR) hadn't been mothballed, or others lost at launch, or unbuilt satellites had been built, but barring all that... all you have is speculation. Your assumption, however, that clouds must increase albedo is false. Again, read the above post, and other material. Clouds at high altitudes, which are expected to increase with warming, are composed of ice rather than water. These clouds are virtually transparent to visible light and so do not change the earth's albedo. They do, however, absorb in the infrared and so (as does all H2O) act as powerful greenhouse gases (even though they're solid, not gaseous). Similarly, lower (non-ice) clouds at night will trap heat without changing the albedo at all, so timing of development/dissipation is a factor. Along those same lines, clouds in winter (when the angle of incidence is already low, and the surface being shielded by the clouds is likely snow covered) will have no net change (or even a positive change!) in albedo, while still exhibiting GHG effects. So the assumption that clouds will increase albedo is based on an oversimplification which requires considerably more thought, research and observation. Citation, please. I don't know why you say this. If by 3.7 W/m2 you mean the effect of doubling CO2, then with a climate sensitivity of 3˚C (which is the current best estimate), that would translate into 3.7*3 = 11.1 W/m2, not 16.6 W/m2. Your equations are wrong. You are comparing the wrong factors. The equilibrium temperature of a body is that at which it emits the same amount as is being absorbed. Basically, the equilibrium temperature of the earth would be that at which it emits the same amount of energy as absorbed (i.e. absorbs 239 W/m2, then emits 239 W/m2). If CO2 adds the equivalent of 3.7 W/m2, then the total amount absorbed by the climate system becomes 239 W/m2 + 3.7 W/m2 = 242.7 W/m2. With expected feedbacks, this would be 239 W/m2 + 11.1 W/m2 = 250.1 W/m2. The question is, what surface temperature (actually, combined ocean/surface/atmospheric temperatures) results in this amount of emission (radiation)? The answer is a total of 3˚C. ...where is all the energy coming from that is supposed to be causing the enhanced warming? Outside of the above discussion, I think a major mistake that you may be making (this is a guess) is to equate water vapor feedback with clouds. While increased water vapor could result in more clouds, this is not necessarily the case, and clouds are not the form in which the main feedback would occur. Increased temperatures would increase the specific humidity... the amount of moisture carried in the air not in the form of clouds (condensation). This would be a proportional increase for every cubic meter of atmosphere, and H2O is a very powerful greenhouse gas. This would be the main contributor -- water vapor -- to positive feedbacks. Other positive feedbacks would include clouds (of different sorts), reduced snow and ice, natural release of CO2 and CH4, as well as others. All total, these would result in 3˚C of warming per doubling of CO2. "Your assumption, however, that clouds must increase albedo is false. Again, read the above post, and other material. Clouds at high altitudes, which are expected to increase with warming, are composed of ice rather than water. These clouds are virtually transparent to visible light and so do not change the earth's albedo. They do, however, absorb in the infrared and so (as does all H2O) act as powerful greenhouse gases (even though they're solid, not gaseous). So the assumption that clouds will increase albedo is based on an oversimplification which requires considerably more thought, research and observation." My assumption is not that clouds must increase albedo. The point is if clouds operate as a net positive feedback as claimed, and the data doesn't conclusively show that on average they trap more energy than reflect away, the only way clouds could operate as a net positive feedback is through a reduced albedo, which hasn't happened. I am also aware of the various types of clouds and the complexities of each as it relates to potential changes in the energy balance. Citation, please. I don't know why you say this. If by 3.7 W/m2 you mean the effect of doubling CO2, then with a climate sensitivity of 3˚C (which is the current best estimate), that would translate into 3.7*3 = 11.1 W/m2, not 16.6 W/m2." It takes +16.6 W/m^2 at the surface for a 3 temperature rise. The 3.7 W/m^2 from 2xCO2 is the additional incident energy at the surface. This is then subject to the system gain or system amplification, which is a factor of about 1.6 (390 W/m^2/239 W/m^2). 3.7 W/m^2 x 1.6 = 6 W/m^2, which BTW, is how they are coming up with a 1 C intrinsic rise from 2xCO2, because +6 W/m^2 = +1C from the Stefan-Boltzman law. Basically, the equilibrium temperature of the earth would be that at which it emits the same amount of energy as absorbed (i.e. absorbs 239 W/m2, then emits 239 W/m2)." I'm aware of this. In simple energy balance terms, it takes about 390 W/m^2 at the surface to allow 239 W/m^2 to leave the system, offsetting the 239 W/m^2 coming in from the Sun. This is the system measured amplification factor of only about 1.6 to surface incident energy. The AGW claim of a 3 rise requires an amplification factor of 4.5 to allow and additional 3.7 W/m^2 incident on the surface to leave the system to restore equilibrium (239 W/m^2 in and out). In short, if it is going to take an additional 16.6 W/m^2 to allow 3.7 W/m^2 to leave the system to restore equilibrium, then why doesn't it take 1075 W/m^2 at the surface to allow the 239 W/m^2 from the Sun to leave the system at initial equilibrium (16.6/3.7 = 4.5; 1075/239 = 4.5)??? When there is a radiative imbalance, i.e. from additional CO2 added to the atmosphere which redirects more outgoing surface radiation back toward the surface, there is reduction in the amount of LW radiation leaving at the top of the atmosphere (more radiation is arriving from the Sun than is leaving at the top of the atmosphere). To achieve equilibrium, the system warms up until it again radiates the same amount of energy as is arriving from the Sun. To give a numerical example, there is about 239 W/m^2 arriving post albedo from the Sun and 239 W/m^2 leaving at the top of the atmosphere. This represents the system in equilibrium (energy in = energy out). If there was a radiative imbalance (or 'radiative forcing') of say 3.7 W/m^2 from a doubling of CO2, the energy leaving at the top of the atmosphere would reduce by 3.7 W/m^2 to 235.3 W/m^2. Currently, there is about 390 W/m^2 emitted by the surface. In this example, an additional 3.7 W/m^2 is received by the surface for a total of 393.7 W/m^2. The +3.7 W/m^2 is responded to the same as the 239 W/m^2 arriving from the Sun and will be amplified by a factor of about 1.6 (390/240 = 1.6), as this is the measurement of the surface response to incident energy. 3.7 W/m^2 x 1.6 = 6 W/m^2 to allow an additional 3.7 W/m^2 to leave the system to restore equilibrium (239 W/m^2 in and out). The new surface emitted radiation would be 396 W/m^2 (390 W/m^2 + 6 W/m^2), which corresponds to about a 1 C rise in temperature. What data? Again, citation please. Although, I'd point out that as with everything, the climate has barely begun to reflect the changes. We haven't come close to doubling CO2 yet, and we've only seen half of the 1.4˚C of warming to which we've already committed. So the data isn't very likely to conclusively show anything, but that hardly makes it an argument that something is wrong. It takes +16.6 W/m^2 at the surface for a 3 temperature rise. Where are you taking this from? Again, where are you getting this math from? Do you have a source, or is it your own inference? No. This is a gross oversimplification of the problem, and will lead to errors. It is also flat out incorrect. Notice that the energy entering the system from outside is only 184 W/m2, and only 161 W/m2 of that is absorbed. Because your premise, that "it will take an additional 16.6 W/m2..." is incorrect. Response: [muoncounter] This gain theory/calculation was discussed in excruciating detail on Lindzen and Choi find low sensitivity. Please do not restart it here.
" It takes +16.6 W/m^2 at the surface for a 3 temperature rise. Where are you taking this from?" From the Stefan-Boltzman law. At a temperature of 288K, the surface emits about 390 W/m^2. At a temperature of 291K (+3C), the surface emits 406.6 W/m^2 (+16.6 W/m^2). "Again, where are you getting this math from? Do you have a source, or is it your own inference? Notice that the energy entering the system from outside is only 184 W/m2, and only 161 W/m2 of that is absorbed." The total energy entering the surface is 239 W/m^2. Trenberth has 161 W/m^2 coming in directly from the Sun. The remaining 78 W/m^2 from the Sun he designates as absorbed by the atmosphere and brings it to the surface as 'back radiation'. Only it's not really 'back radiation' but 'forward radiation' that last originated from the Sun (as opposed to 'back radiation' as being energy that last originated from the surface). So, 239 W/m^2 incident on the surface becomes 396 W/m^2 from 157 W/m^2 of 'back radiation' from the atmosphere (239 + 157 = 396). Where do you get 157 of "back radiation"? Why do you treat the energy absorbed by the atmosphere as absorbed by the surface? Why and how do you use Stefan-Boltzman to compute the component 16.6 W/m2? FYI... These are rhetorical questions. I don't really want to know. Your entire model is invalid. You need to study more, and completely rethink things. There is no 1.6 amplification factor needed to allow an additional 3.7 W/m2 to leave the system. I still have no idea where you got your 16.6, or what you think it means. You will never get an answer to this question because it is non-sensical. You need to look at things more carefully, probably abandon your current assumptions and perspective, and try to see if you can understand it properly. I suggest starting completely from scratch. I don't think that I can help you. You need an open mind, serious study time with books, and to let go of whatever it is you think that you know. There's a guy over at Nova's loony-bin site who does stuff like you're doing. If you're trying to learn by listening to him, you're only to wind up being get very, very confused. "FYI... These are rhetorical questions. I don't really want to know." OK, then I won't answer. "Your entire model is invalid." I don't have a model. All of my numbers and calculations are from measured or generally accepted data. "You will never get an answer to this question because it is non-sensical." I'll probably never get an answer because this is a significant whole in the AGW theory that no one seems to be able to explain (that the system's response to GHG forcing will be much greater than it is to solar forcing). "I don't think that I can help you." I appreciate that you seem to be interested in helping me, but I'm not really interested in being helped per say. I'm a staunch skeptic of AGW, so my purpose here is to present contradictory evidence and logic that disputes the theory. That's what I'm doing. "There's a guy over at Nova's loony-bin site who does stuff like you're doing. If you're trying to learn by listening to him, you're only to wind up being get very, very confused." I'm not sure exactly who you are referring to, but I learn and have learned from listening to a multitude of sources - both for and against AGW. I don't care if it's from the Easter Bunny or Einstein - if I can understand it and not find fault in the evidence, reasoning and logic behind it, I accept until it's been adequately challenged or discredited. I have not seen, in my estimation, these relatively simplistic things explained by the pro-AGW advocates. Response: [DB] Please, everyone, RW1 has amply demonstrated over many threads and in comments almost beyond number that he's not interested in learning anything here (by his own admission), but only in putting his own brand of logic and and calculus on display. Thank you all for the good faith efforts, but DNFTT. Thanks! That word doesn't mean what you think it means. A skeptic ~is~ interested in being helped. You have described something else. I don't have a model. Of course you do. Everything in science is a model. You have a mathematical model (a set of rules and assumptions) that you've used to derive your proposed answer from the data. But that model -- the rules and assumptions you are following -- are flawed. This is untrue. You are the only person on the planet to have arrived at this conclusion, because your underlying model (understanding) is flawed. ...my purpose here is to present contradictory evidence and logic that disputes the theory. That's what I'm doing. No, what you're doing is confusing people with your own personal creation of faux-math-science. I have not seen, in my estimation, these relatively simplistic things explained by the pro-AGW advocates. No one can explain to you why 2 plus A does not equal monkeys, because it's not even a mathematical equation. Similarly, your insistence that some theory must explain your 1075 W/m2 number will never happen. That's an oxymoron. No one can be a "staunch" skeptic. Being skeptical means questioning what you are first shown until it is satisfactorily proven, not questioning it endlessly with no hope of acceptance or understanding, because you staunchly refuse to be anything but eternally skeptical. Response: [Muoncounter] We've been down this painful road before. Please do not encourage another go round. The other player in the drama is known as co2isnotevil, which should tell you all you need to know about his viewpoint. Sorry, but I'm not interested in a semantics debate regarding the definition 'skeptic'. "This is untrue. You are the only person on the planet to have arrived at this conclusion, because your underlying model (understanding) is flawed." I don't see how this is untrue. I make no claim that it's an impossibility, but it is true that the AGW theory claims the next 3.7 W/m^2 incident on the surface will be amplified by the system nearly 3 times a much as the original 239 W/m^2 incident on the surface from the Sun. If, as the AGW theory claims, an additional 3.7 W/m^2 at the surface is to become 16.6 W/m^2 mostly through positive feedback, quantify specifically how the feedback causes this much change while it doesn't for the original 98+% (239 W/m^2) from the Sun. "But that model -- the rules and assumptions you are following -- are flawed." Dessler 2010 seems to be claiming that clouds are trapping more energy as the surface warms. cloud feedback here is positive." Is he claiming that clouds are changing in a way that results in them trapping more surface energy? If yes, how has he rectified this with all the data (i.e. how has he shown that the additional energy the clouds trap is greater than the additional energy they reflect away)??? Response: [Muoncounter] There is an existing thread for Dessler's paper; check to see if your question was already addressed. You misunderstand, and then cling to your misconceptions. You need to spend less time lecturing, and more time reading and studying, to figure out for yourself where your own mistakes are. @RW1 9of17 comments to this post, so far. You are likely to get soon a DNFTT banner in your comments and I'd like to explain why is that. T - "If I throw this stone into the water it'll float"
P - "No, it'll sink, stone's density is higher that water's"
T - No, it'll clearly sink. Don't you see the weight of the stone is less than the weight of the water, you, idiot? You might think that the trolling part is "you, idiot", but that is clearly just something said on the heat of the debate and doesn't affect the intellectual content of it, so it's easily dismissed. The trolling part is simply the underlying lie about the world of Physics: the twisted pricipia that things float if they amount a lesser weight. The "no" and the "you, idiot" part just reinforces the idea that the troll has made his/her mind -nobody cares about how or why- and he/she's simply "trolling around". I suppose that many fellows who think that there's a "global warming hoax" of some kind, sort of they come to websites like this "to get our voices heard about that outrageous subject", and that they experience comforting feelings if they overflow threads and the comment sections and then get a trolling banner just for "hitting the nerve" and as a result of "the nuisance their witty remarks provoke". Please, don't fool yourself with such naïvités. You're in an academical site and you have the ethical obligation of being diligent in detecting or correcting any wrong product of you animus. It also happens that the fact that you detect the gruesome mistake in the 'floating' example doesn't mean you are not gruesomely mistaken just because you cannot detect it. The principle for (legally) capable people that states "nobody can argue his own slowness and clumsiness to justify an error" comes from that obligation of diligence. In sites like this it translates in a diligent revision of your knowledge matrix once it has being pointed at you gruesome conceptual mistakes. The worst thing it could happen is that you learn something. ERRATUM: Where it say "No, it'll clearly sink." it must say "No, it'll clearly float." I in no fashion mean to downplay your sincerity in your beliefs from what you've learned from G White and the like. In order to help you better convey your position with greater clarity, I suggest you learn to better discern the point between where established physics and that you've learned from Mr. White diverge. If you can serve that divergence up with clarity and precision, I think then that others will be better able to understand you. It will necessarily entail (as Sphaerica has pointed out with greater eloquence than I), however, temporarily setting aside those learnings and preconceptions gained from the table of Mr. White to leap into mainstream physics deep enough to better educate yourself on where that difference lies, so you can then relate that point to others. At that point you should also be then able to construct tests for your hypothesis that can then be examined by others. In short, you will have a publishable basis for submission to peer-review. "I in no fashion mean to downplay your sincerity in your beliefs from what you've learned from G White and the like. In order to help you better convey your position with greater clarity, I suggest you learn to better discern the point between where established physics and that you've learned from Mr. White diverge. If you can serve that divergence up with clarity and precision, I think then that others will be better able to understand you. It will necessarily entail (as Sphaerica has pointed out with greater eloquence than I), however, temporarily setting aside those learnings and preconceptions gained from the table of Mr. White to leap into mainstream physics deep enough to better educate yourself on where that difference lies, so you can then relate that point to others." Where does the difference between "established physics" lie ? This is what I don't understand. These kinds of responses are not scientific discussion - they're just empty platitudes. Yes, it's no secret I've spent a considerable amount of time studying GW's research and he has been very generous to me. However, I am not "accepting" his research on the basis of his authority or generosity toward me (nor, I'm sure, would he want me to). I've largely accepted it by examining it in detail and weighing it against all the other evidence. But look, I'm not here to discuss GW - I'm here to discuss cloud feedbacks, and would like to get back on topic and return to scientific give and take discussion. Where does the difference between "established physics" lie ? This is what I don't understand. And this is the crux of your problem. 1) Present your own model more clearly. You skip steps, make leaps, then get frustrated when other people can't figure out where you get your numbers from. You even claimed that you didn't have a model! 2) You are the outlier. You are the one with the unconventional point of view. The burden is yours to explain your position, but more importantly to study (as the rest of us have) to learn what the mainstream science says. If you can't see the difference between what you put forth, and what everyone else already understands, the burden falls upon you to educate yourself to eliminate that gap. You can't just demand that everyone answer your questions, when you don't demonstrate a clear grasp of the established science, or when you make incorrect statements that clearly are not in line with the established science, and yet even when this is pointed out, you can't see the difference, stomp your feet, and get flustered. You can complain that something is incorrect if you can demonstrate that you understand things, and can yourself clearly explain where your position diverges. You cannot, on the other hand, complain that you don't know why people can't answer your questions, and yet refuse to consider other points of view yourself. You also should not be adopting the tone that you are right, all of main stream climate science is wrong, and so everyone else owes it to you to prove to you that you are mistaken. Like it or not, you are the outlier. If you want to "sell" your position, you need to do that, by convincing other people, not by demanding that they convince you. Response: [muoncounter] RW1 has explained his position in considerable detail on the Lindzen and Choi thread; it is not necessary to start that up again. He is correct in expressing an interest in staying on topic. As far as I can see RW1 believes that you can infer feedback relationships from the Trenberth state diagram (ie the comments about gain) and then use these no.s to project what the diagram would look like for say doubled CO2. When the no.s dont accord with those calculated properly, then RW1 claims physics is wrong. "1) Present your own model more clearly. You skip steps, make leaps, then get frustrated when other people can't figure out where you get your numbers from. You even claimed that you didn't have a model!" What specifically do you want me to explain? I agree with the moderator that a lot of this has been covered in previous discussions, but if you ask any direct question, I'll do my best to answer it. 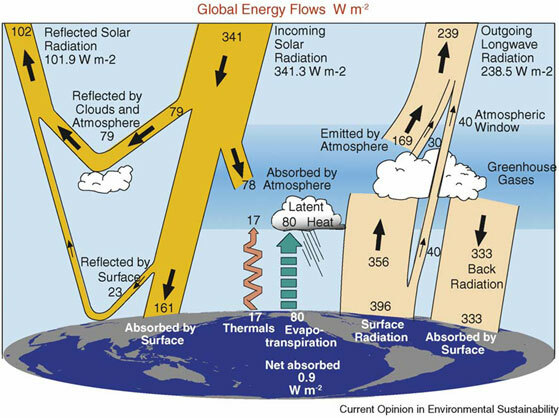 At any rate, I'd like to get back on topic with a question: If clouds are not the primary mechanism modulating the energy balance, and are instead acting to greatly amplify relatively small temperature changes, then what is the primary mechanism controlling the energy balance of the planet? They are not "greatly amplifying" small temperature changes. They do have some impact, but there's no reason to exaggerate things with "great" and "small" to try to score points. ...what is the primary mechanism controlling the energy balance of the planet? I'm not sure why there must be a primary mechanism, and because there are multiple mechanisms, they all interact, they are all difficult to "force," and it becomes a question of semantics in arguing over which is "primary." Clouds (change almost instantaneously, and positive/negative effects are arguable, but relatively inconsequential compared to the bigger factors). Which is primary? At the onset and termination of glacial periods, the orbital forcings, but only through an albedo feedback, and in conjunction with a strong CO2 feedback, which in turn operates in conjunction with the strong H2O feedback. Outside of those periods of orbital forcings, under natural conditions, CO2 is the main long term driver, amplified by albedo, cloud and H2O feedbacks. During anthropogenic pollution, CO2 is the only control mechanism that operates on the time scales that we are witnessing, again amplified by all of the usual feedbacks. "They are not "greatly amplifying" small temperature changes. They do have some impact, but there's no reason to exaggerate things with "great" and "small" to try to score points." OK, fair enough. The point is the AGW theory claims the net effect of clouds is to amplify warming rather than attenuate warming. * Clouds (change almost instantaneously, and positive/negative effects are arguable, but relatively inconsequential compared to the bigger factors)." If the Sun is the source energy and ultimately heat in the system, and if H2O changes so quickly in response to temperature - specifically warming, and water is the primary amplifier but not a controller, what is the controller? If the Sun is the only real heat source, and water concentration (the primary amplifier) is driven by heat from the Sun, the primary controller would need to modulate the amount of the Sun's energy allowed to enter the system. Clouds definitely do this since they make up about 3/4ths of the albedo and are constantly changing spatially and in time - all the time. Is it also a coincidence that clouds are made up of H2O and water vapor concentrations drive cloud formation? It is also another coincidence that water vapor is removed from the atmosphere from precipitation that emanates from clouds? If the net cloud feedback was positive in conjunction with positive water vapor feedback, what would prevent the temperature from rising significantly higher and higher from even just a few days or few weeks of abnormally warm weather? Yet this never happens - abnormally warm weather periods end and normal or colder weather inevitably commences. This is probably because the forces that drive evaporation/water vapor are not as strong as the combined forces of clouds and precipitation. This is fundamentally why net positive cloud feedback is so illogical. During anthropogenic pollution, CO2 is the only control mechanism that operates on the time scales that we are witnessing, again amplified by all of the usual feedbacks." But clouds operate on even shorter time scales than CO2, and temperature fluctuations occur on much shorter time scales too. Let's not forget that the surface of the Earth is over 2/3rds water. The cycle of water -> water vapor -> clouds -> precipitation -> water is enormous. Yes, it is coincidental. That is, both are true, but neither mean anything. Yes it does, every time the seasons change. That is, the change in temperature in the temperate zones is greater than could be accounted for by the mere change in hours of insolation and angle of incidence of the sun (and change in albedo from winter snow to bare ground). Humidity also rises, and the GHG effect from this amplifies the temperature. This happens, any you experience it, every spring. But to give your question a more direct answer, you seem to be describing a runaway. As long as the feedback is less than the original forcing, it is positive, but not a runaway. This is the simple case of a convergent versus a divergent series in mathematics. No. This is an assumption without foundation (as evidenced by the word "probably"). Clouds form or dissipate in a matter of hours. What would be needed to change climate would be a major change in the pattern in which clouds form or dissipate -- where, or when, or how much, by a significant degree, over a long period of time. There is no firm logical reason to think that this would happen (Lindzen argues that it should, but I and most of climate science find his arguments very unconvincing, and observational evidence to date is indecisive, which by itself tells you that it's not a "major" control, or else it would be obvious and unarguable). The fact that you think it could happen easily is in no way evidence that it does happen. But clouds operate on even shorter time scales than CO2, and temperature fluctuations occur on much shorter time scales too. So if they had a moderating effect they would be a serious damper in the system. But they don't. And if they were, because they operate so quickly, you would see their effect instantly. Which is exactly why clouds cannot be a major factor. On the time scales over which clouds vary, if in fact they were a moderating influence, then the temperature of the earth would never, ever vary by more than a fraction of a degree (or the clouds would quickly step in and stop it). You'd never have ice ages, Medieval Warm Periods, Little Ice Ages, or any notable variations. And yet over the history of the earth the temperature has varied by as much as 10˚C. Anything which operates on that fast a time scale is either the primary control, or it's not a control at all. All evidence points to "not at all." It may be a slightly positive or slightly negative feedback, but it's not a control, and not even a major feedback (compared to H2O, CO2, and albedo). Look here for further information on how we know that climate sensitivity is not low, so any moderating influence of clouds cannot be a major, fast acting factor. Aerosols (due to volcanic activity, these can act very, very quickly, but by themselves are normally short lived, but gain "traction" by reducing the planet's albedo long enough to instigate other feedbacks which can be longer lived). "Yes, it is coincidental. That is, both are true, but neither mean anything." The AGW theory seems to require an awful lot of coincidences. "Yes it does, every time the seasons change. This happens, any you experience it, every spring." I generally meant globally - not seasonal or more local temperature change. I'm well aware that seasonal change is due to significant hemispheric insolation change. "But to give your question a more direct answer, you seem to be describing a runaway. As long as the feedback is less than the original forcing, it is positive, but not a runaway. This is the simple case of a convergent versus a divergent series in mathematics." I'm not describing a runaway effect. "So if they had a moderating effect they would be a serious damper in the system. But they don't. And if they were, because they operate so quickly, you would see their effect instantly. Which is exactly why clouds cannot be a major factor. On the time scales over which clouds vary, if in fact they were a moderating influence, then the temperature of the earth would never, ever vary by more than a fraction of a degree (or the clouds would quickly step in and stop it)." But it generally does not vary by much at all. The global mean average temperature tracks very, very tightly - rarely is there a difference from year to year more than 2 or 3 tenths of degree. "Anything which operates on that fast a time scale is either the primary control, or it's not a control at all. All evidence points to "not at all." OK, so then what is the mechanism controlling the energy balance? What is keeping the global average temperatures so tightly in check from year to year? From decade to decade? From century to century? Why don't we see much larger variation - like multiple degree C per year, per decade, per century? The climate system as a whole is remarkably stable. "Which is exactly why clouds cannot be a major factor. On the time scales over which clouds vary, if in fact they were a moderating influence, then the temperature of the earth would never, ever vary by more than a fraction of a degree (or the clouds would quickly step in and stop it). You'd never have ice ages, Medieval Warm Periods, Little Ice Ages, or any notable variations. And yet over the history of the earth the temperature has varied by as much as 10˚C"
Most of these changes, except the MVP and LIA, are much longer term and driven by very large external forces - not relatively small internal forcings. External influences aside, just topographical differences alone due to plate tectonics had a huge impact on surface albedo over the Earth's history, which in turn had a huge influence on temperature and climate. The ice ages and interglacials are driven by changes in the Earth's orbit, etc. "It may be a slightly positive or slightly negative feedback, but it's not a control, and not even a major feedback (compared to H2O, CO2, and albedo)." I don't know how you can say this. A very large amount (if not most) of the enhanced warming from the climate models comes from positive cloud feedback. "Look here for further information on how we know that climate sensitivity is not low, so any moderating influence of clouds cannot be a major, fast acting factor. 'For example, between glacial and interglacial periods, the planet's average temperature changes on the order of 6°C (more like 8-10°C in the Antarctic). If the climate sensitivity is low, for example due to increasing low-lying cloud cover reflecting more sunlight as a response to global warming, then how can these large past climate changes be explained?'" Very simply. The large change and increase the distribution of the Sun's energy in the northern hemisphere combined with a positive surface albedo feedback is enough to overcome the negative cloud feedback. RW1 - "OK, so then what is the mechanism controlling the energy balance? What is keeping the global average temperatures so tightly in check from year to year? From decade to decade? From century to century? Why don't we see much larger variation - like multiple degree C per year, per decade, per century? The climate system as a whole is remarkably stable." To put things briefly: Power radiated to space scales with T^4. This extremely powerful negative feedback keeps the temperature within the ranges you are discussing here. Unless the rate of energy input (insolation changes, large scale albedo from, say, ice changes) or output back to space (emissivity changes due to GHG's) change over an extended period of time (which tends to rule out clouds given their very fast response rate), temperatures will stay near the range determined by the energy boundary conditions. RW1 - Sorry, looking at my last post I may have left some things unclear. Temperature averages will always, over the long term average, stay near the limits determined by the energy boundary conditions. Long term temperature averages change when those boundary conditions change. What's controlling the 'energy boundary conditions'? The boundary condition is that climate energy in = climate energy out when averaged over the long term (i.e., longer than internal variations such as ENSO and yearly seasons, which is apparently about 30 years or so). As to what changes those conditions? Everything Sphaerica listed here. One critical thing is that if the response time of any influence on the energy flows to temperature is considerably shorter than the climate internal variation time frames, it can only be a feedback (responding to changes) rather than a forcing causing long term changes. Water vapor and clouds have response times << ENSO and seasons, and any internal variation in water vapor and/or clouds will get overridden by those variations. Water vapor and clouds respond to climate changes, but cannot cause them. Response: [DB] Removed "of one" text string per request. "As to what changes those conditions?" I asked what's primarily controlling those conditions? What's keeping the 'boundary conditions' (power in = power out) so stable from year to year, given all those influences Sphaerica listed - specifically the water vapor, the "primary amplifier"??? "This extremely powerful negative feedback keeps the temperature within the ranges you are discussing here. What's the mechanism driving the 'extremely powerful negative feedback'??? If it's not primarily clouds through their ability to reflect sunlight and precipitate water out of the atmosphere, then what is it? What's the mechanism driving the 'extremely powerful negative feedback'??? If it's not primarily clouds through their ability to modulate incoming solar energy and precipitate water out of the atmosphere, then what is it? RW1 - Water vapor is an amplifier, a positive feedback. Clouds are a less well understood feedback; most estimates are that they are slightly positive, but not overwhelmingly so. Neither can be a driver of climate, however, since they respond so quickly to temperatures. They cannot stay consistently out of balance long enough to push anything else out of balance. Keep in mind that seasonal and aperiodic variations such as ENSO make water vapor and clouds vary hugely - they are really more amplifiers of internal variance on those time scales. As to the stability of the other possible modifiers of energy in/energy out - look to the variances and speeds there of of insolation/solar cycles, Milankovitch cycles, volcanic and other aerosol sources, ice coverage change speeds, etc. And don't forget the speed of change of anthropogenic forcings, primarily CO2. Which is changing faster than any of the other forcings, in fact faster than all the other forcings are changing combined. And which naturally responds as a feedback to temperature changes on perhaps a 500 year schedule - meaning CO2 imbalances last long enough to shift the climate energy balance and average temperatures. You keep creating your own conditions. What's the mechanism driving the 'extremely powerful negative feedback'??? There is none. There doesn't have to be. Insolation is 290W/m2. The planet radiates 290W/m2. Everything (normally) stays in pretty good balance as easily as that. We as humans experience weather, which include daily, seasonal, annual and decadal fluctuations. These are caused by a variety of factors. But the bottom line is 290 in, 290 out. If the temperature of the planet appears to cool, then there is less out for a while. This can only go on for only so long before it catches up and the balance is restored. No clouds or other moderator are needed. The system does not need to behave like a human designed EE system, or contain the same components (i.e. a primary "control"). You're basically making it way more complicated than it needs to be -- or is. This is a foolish and disingenuous thing to say. It's an appeal rather than a fact, and has no substance whatsoever. To me, your theories are the ones that require an awful lot of coincidences. So avoid sweeping, casual and incorrect statements like this. Appeals to emotion are debate tactics, not science, and if the conversation goes there, I leave. You should also avoid referring to "AGW theory." There is no such thing. There is a GHG theory, which is a proven fraction of climate science. There is all of climate science, which is advancing and changing every day. There is no single "AGW theory," and attempts to cast it as such are merely backhanded attempts to imply that there's something simple there that can easily be ignored or dismissed. It doesn't work that way. The volume of information behind current climate science is enormous, and it's not going to be easily overturned by someone on a blog who has his own ideas about how things work. A very large amount (if not most) of the enhanced warming from the climate models comes from positive cloud feedback. This is not true. Citation, please. "This is not true. Citation, please." "In AOGCMs, the water vapour feedback constitutes by far the strongest feedback, with a multi-model mean and standard deviation for the MMD at PCMDI of 1.80 ± 0.18 W m–2 °C–1, followed by the (negative) lapse rate feedback (–0.84 ± 0.26 W m–2 °C–1) and the surface albedo feedback (0.26 ± 0.08 W m–2 °C–1). The cloud feedback mean is 0.69 W m–2 °C–1 with a very large inter-model spread of ±0.38 W m–2 °C–1 (Soden and Held, 2006)." "In the idealised situation that the climate response to a doubling of atmospheric CO2 consisted of a uniform temperature change only, with no feedbacks operating (but allowing for the enhanced radiative cooling resulting from the temperature increase), the global warming from GCMs would be around 1.2°C (Hansen et al., 1984; Bony et al., 2006). The water vapour feedback, operating alone on top of this, would at least double the response. The water vapour feedback is, however, closely related to the lapse rate feedback (see above), and the two combined result in a feedback parameter of approximately 1 W m–2 °C–1, corresponding to an amplification of the basic temperature response by approximately 50%"
"Because the water vapour and temperature responses are tightly coupled in the troposphere (see Section 8.6.3.1), models with a larger (negative) lapse rate feedback also have a larger (positive) water vapour feedback. These act to offset each other (see Box 8.1). As a result, it is more reasonable to consider the sum of water vapour and lapse rate feedbacks as a single quantity when analysing the causes of inter-model variability in climate sensitivity." The bottom line is a lot of the enhanced warming comes from positive cloud feedback. "To me, your theories are the ones that require an awful lot of coincidences." "You should also avoid referring to "AGW theory." There is no such thing. There is a GHG theory, which is a proven fraction of climate science. There is all of climate science, which is advancing and changing every day. There is no single "AGW theory," and attempts to cast it as such are merely backhanded attempts to imply that there's something simple there that can easily be ignored or dismissed." Sorry for the confusion. When I refer to the "AGW theory", I just mean the catastrophic or enhanced warming of around 3C predicted by the models, the IPCC, etc. That's all. "There is none. There doesn't have to be. Insolation is 290W/m2. The planet radiates 290W/m2. Everything (normally) stays in pretty good balance as easily as that. But the bottom line is 290 in, 290 out." I know energy has to be conserved (energy in = energy out) - that isn't the point. The point is the equilibrium global surface temperature from year to year fluctuates very, very little. This has nothing to do with energy always needing to being conserved. "If the temperature of the planet appears to cool, then there is less out for a while. This can only go on for only so long before it catches up and the balance is restored." Actually, when the planet cools (or is cooling), there is more going out than coming in for a while, but think you're confusing equilibrium being restored and temperature being restored. They are two totally different things. "And don't forget the speed of change of anthropogenic forcings, primarily CO2. Which is changing faster than any of the other forcings, in fact faster than all the other forcings are changing combined." I don't see how this is so. Anthropogenic CO2 forcing is very gradual, taking decades and centuries. Water vapor and clouds act on time scales of hours to days. RW1#43: "CO2 forcing is very gradual, taking decades and centuries." Centuries? How do you know that? See the thread 40 Year Delay, which suggests that the thermal inertia of the oceans results in a lag to full warming from CO2 forcing on the order of 40 years. "Clouds cover 2/3rds of the surface, so 341 W/m^2 x 0.67 = 228 W/m^2 average incident on the clouds. 79 W/m^2 divided by 228 W/m^2 = 0.34 average reflectivity of clouds. 1/3rd of the surface is cloudless, so 341 W/m^2 x 0.33 = 113 W/m^2 average incident on the cloudless surface. 23 W/m^2 divided by 113 W/m^2 = 0.20 average reflectivity of the cloudless surface. 0.34 - 0.20 = 0.14. 341 W/m^2 x 0.14 = 48 W/m^2 loss for each additional m^2 of cloud cover." There is slight error in this calculation, which I would like to correct for the record. The average reflectivity of clouds is actually about 0.35 (not 0.34), which corresponds to about 51 W/m^2 loss for each additional m^2 of cloud cover instead of 48 W/m^2, resulting in a net loss about 12 W/m^2 instead of 10 W/m^2. Centuries? How do you know that?" Because it's claimed to take about 100 years to double CO2. "In AOGCMs, the water vapour feedback constitutes by far the strongest feedback..."
Water vapor does not equal clouds. The two are very distinct and different. Water vapor involves a GHG effect which is stronger than that of CO2, and is listed in my feedbacks (as H2O). Again, no, clouds come in a distant fourth, at best, behind H2O feedbacks (water vapor), CO2 feedbacks, and albedo feedbacks. When the planet cools, it radiates less, not more. The point is the equilibrium global surface temperature from year to year fluctuates very, very little. This has nothing to do with energy always needing to being conserved. No, it doesn't, but it also has nothing to do with clouds. It has to do with the fact that the only mechanism for actual cooling the planet is to either reflect or radiate heat, and the only mechanism for warming is to trap heat. As such, the planet has a fairly stable climate because very little will naturally change the chemical balance of the atmosphere or the albedo of the surface except over very, very long time frames. None of this says that clouds have to be some powerful control knob that keeps everything mellow. The planet stays where it is because it is very, very hard to shift it out of balance (as evidenced by the small changes in climate despite large changes in orbital forcings, except for that perfect case that initiates or terminates an interglacial). You can't say that clouds must be a mitigating factor because you figure they must be. You're going to need much stronger evidence than that. Normal climate change takes millenia. The 0.3˚C swings in global temperature that have been normal for the past two thousand years are not climate change. And clouds have nothing to do with anything. Please begin providing evidence instead of mere assertions. RW1#:46 "it's claimed to take about 100 years to double CO2." Huh? What does that have to do with the rate at which CO2 radiative forcing increases global temperature?